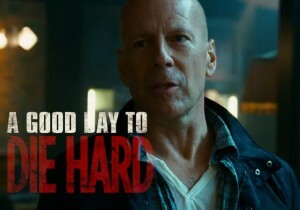 John McClane is back people in A Good Day to Die Hard, and he’s just as adept at saving the day – and in this case his son, John McClane Jr (played by Jai Courtney) – as he ever was. Ever since the original Die Hard came out in 1988, the unassuming NYPD cop who always seemed to be in the wrong place at the wrong time (frankly if I saw him getting on my flight, I would immediately get off it) and who described himself in an earlier trailer for this movie as “007 of Plainfield N.J.”, has been one of the iconic action heroes that set the template for pretty much anyone who followed. Amazingly all these years later, he doesn’t appear to have lost his edge, nor his appetite for taking on the bad guys (which in this case include his temporarily wayward son), and certainly not ability to crash through windows. While my appetite for big blockbusters may be waning in favour of more nuanced narrative-rich indie fare, you can rest assured I will be lined, giant bucket of popcorn in hand, to watch this movie the day it opens. Or the next day possibly since it opens on Valentine’s Day 2013 and my partner may not think of this as the romantic of movies. * Check out E Online’s announcement of the new trailer – lot of fun!